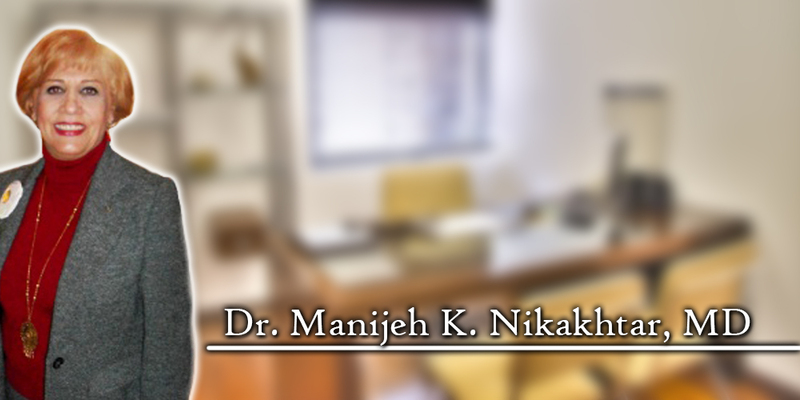 Dr. Manijeh Nikakhtar is a renowned professional in the field of Medicine, Psychiatry, Forensic Psychiatry, and Public Health. She has an international academic and professional background, having studied, taught, and conducted research in the field of Public Health, Psychiatry and Chemical dependency. In Iran, she represented the World Health Organization in the Middle East and was also the chair person in the Department of Epidemiology and Patho-biology. In the United States, she completed a fellowship at Cornell University in their New York Hospital and an internship and residency in psychiatry at USC. Dr. Nikakhtar served as Clinical Assistant Professor at UCLA and on the Advisory Board of the Metropolitan State Hospital in Los Angeles. She is also a Diplomat for the American Board of Forensic Medicine and Psychiatry, American Board of Psychological Specialties, American Board of Behavioral Sciences, American Board of Psychopharmacology, and American Board of Forensic Psychoanalysis. She has served the Southern California Psychiatric Society for many years as a member of the Ethics Committee and as Chair Person of its Membership Committee. Adding to her long list of outstanding accomplishments, Dr. Nikakhtar has published over 150 articles in the field of medicine and psychiatry (Suicide, Anxiety, Panic Disorders, Depression, Culture and behavior, Family therapy, Addiction)in Persian Journals. Dr. Nikakhtar is the founder of a non-profit organization, “Citizens of the World for Humanity". Dr. Nikakhtar is the founder of the Substance Abstinence Treatment (SAT) program which is a revolutionary and highly effective treatment model for substance abuse and addiction. It is based on an innovative and scientific method designed to break the cycle of drug users' going in and out of the revolving door of the traditional recovery program or prison system. For her outstanding service to the community, Dr. Nikakhtar has been recognized with many awards and certificates from various California officials and organizations, including the Governor, the Director of the Department of Mental Health, the Los Angeles County Board of Supervisors, The County Sheriff, The Mayor of Los Angeles and the Chief of the Police. Dr. Nikakhtar had eight years of Persian radio talks and TV programs to educate the public about psychiatric disorders and treatment. Dr. Nikakhtar has also been interviewed by a variety of magazines (Los Angeles Times, Vanity Fair, People Magazine, La Opinion etc) and TV programs (CNN, E-TV, PBS, etc) on subjects related to mental health and addiction. Dr. Nikakhtar is the author of the book titled: Addiction or Self-Medication? The Truth. This book is a breakthrough view of substance addiction and recovery and outlines the components of a comprehensive, scientific, state-of-the art approach for the treatment of chemical dependency and addiction. Dr. Manijeh Nikakhtar is married and has two adult children. Dr. Nikakhtar's husband is an Internist-Nephrologist and Professor of UCLA. Dr. Nikakhtar's daughter is an attorney and economist, assigned to be a professor at George Washington University. Dr. Nikakhtar's son is an Internist, Clinical Assistant Professor and Director of Medical Education at the University of Minnesota at Minneapolis.